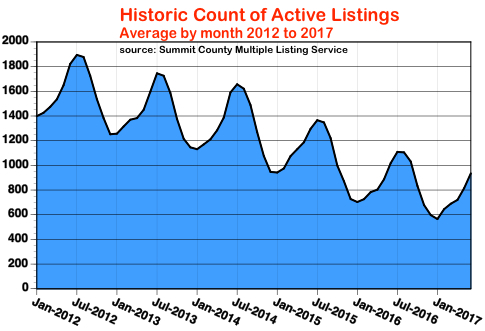 The historically low number of properties for sale in Summit County continues in the first half of 2017. The most undersupplied part of the market continues to be lower priced properties, and right now that means under $700,000 in our market. 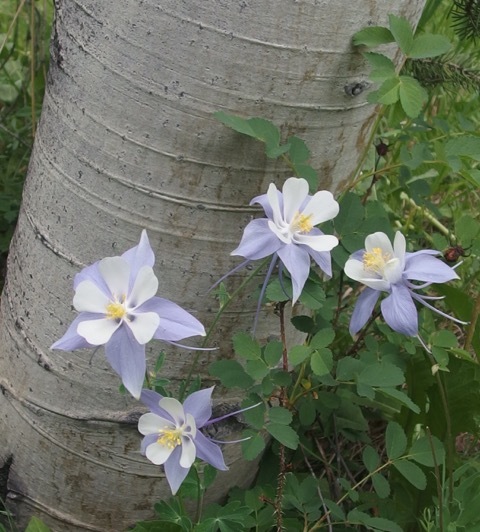 For instance, there were a total of 4 properties offered in Summit County for under $200,000 on July 1. 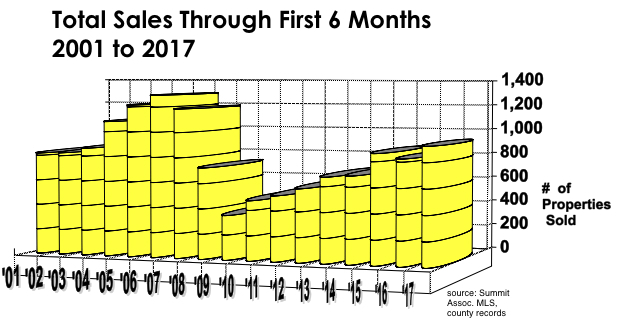 On July 1 there were a total of 576 residential properties for sale out of a total 890 listings for all types of property: land, commercial, etc. This is less than half of the historically normal number for the first weeks of July when the inventory typically reaches its peak for the year. Fewer than 200 of these residences were priced under $700,000. Nearly 700 of that price had sold in the first half of the year. The most oversupplied part of the market is in the $900,000 and up range. 280 residences were priced at $900,000 or more. By July 1, fewer than 200 had sold. Homes and condominiums under $700,000 averaged 76 days on the market including time to close. Those priced above $900,000 averaged 225 days on the market. Overall, twelve percent more properties had sold in the first half of 2017 than in the same period of 2016 for an average price 17.5 percent more than in 2016. 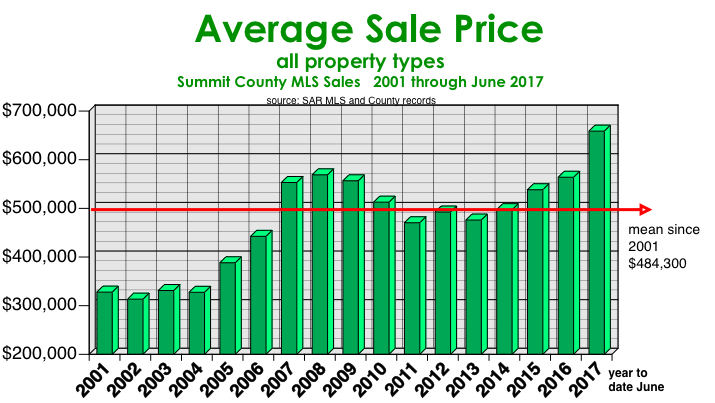 The average sale price in Summit County is now nearly $660,000, the highest in history by about $100,000. The low priced part of the market seems to be appreciating faster than the higher end pushed by the lack of supply. While sales volume has not regained the level last seen in 2006 when nearly1300 properties sold in the first half, 924 sales is the best since 2007. The question is: if there were the same number of properties for sale this year as in 2006, would there be as many sales? My guess is probably not. The seemingly hot market is artificially caused by the lack of product to sell. Every broker has a list of buyers waiting for something in the size, price and location they need to come on the market. For the past several months, when something “affordable” appears, it hasn’t lasted through the next weekend if it’s priced correctly. That may be changing. As more properties come on the market, they seem to be staying a bit longer. It may take a couple of weeks now to sell. If this trend continues, it will be a sign that the pent-up buyer demand is being filled and fewer buyers are getting on the list. The last time average prices increased this rapidly was in 2005 through 2007 when increases of 15 to 25 percent per year were happening. It has taken 10 years since that kind of appreciation happened and in that 10 year period, there were four years when the average price declined. For now, if you are a buyer looking for a second home or investment for the long term and you find the right property at the right price, don’t let short term uncertainty stop you. This has never been a fix and flip market. If you are an owner thinking of selling, you should decide soon while conditions favor the seller and prices are back at the historic highs. Or settle in to keep the property until the next opportunity. Guys, you’re both wrong. Didn’t your Realtor tell you about THE THREE BIG OUTS? Well, listen up. Is this what your Realtor does with the earnest money? NOT ON YOUR LIFE!! Every Colorado Real Estate Commission approved contract has several ways for Buyers to go under contract for a property and still have time to investigate and terminate the sale with no penalty. BIG OUT #1: The Inspection. By a certain date in every contract, Buyers have the right to have an inspection done (or not) and either terminate the contract or present a list of things they want corrected by the Seller. If that list is not negotiated out in writing by a second date, the contract automatically terminates and the Buyer is gone if she wants to be. BIG OUT #2: The Title and Homeowner’s Association Documents. All the title and HOA documents for the property must be delivered to the Buyer by a certain date. By a second date, the Buyer may object to the title and/or HOA documents. If the association documents are not acceptable, the Buyer is out of the deal automatically upon notice to the Seller. Let’s say he wants to rent the property out but the association documents forbid rentals. He’s gone if he wants to be. BIG OUT #3: The Loan. After receiving notice of loan approval from the lender, usually just before closing, the Buyer may still terminate if, in her sole judgment, she doesn’t like the loan. These are just the BIG OUTS. There’s several little ones, too. Generally, Buyers are well protected by our Colorado contracts… if they pay attention to dates. Sellers always take the risk that one of these outs will sink the contract. The best we can do is to cut the exposure time for these contingencies. We try to get the inspection and title objection deadlines out of the way in a couple of weeks or less. The loan deadline will always be the longest exposure, but pre-qualification or pre-approval by a lender can lessen that risk. To lose any earnest money, the Buyer has to be oblivious to the process, miss all the dates, not make loan application, buy a new pickup truck the week before closing or just not show up to close. It happens, but rarely. That’s why your crafty Realtor rarely vacations with forfeited earnest money and Sellers shouldn’t get too excited about the minivan before closing. Trains to the Mountains? You mean like those cute little ones in Switzerland? Those will never work in America! Despite years of construction of new express lanes and other improvements, I-70 continues to be a hindrance to visitors. Numerous closures result from seemingly average snowstorms. And summer isn’t much better on weekends and holidays. 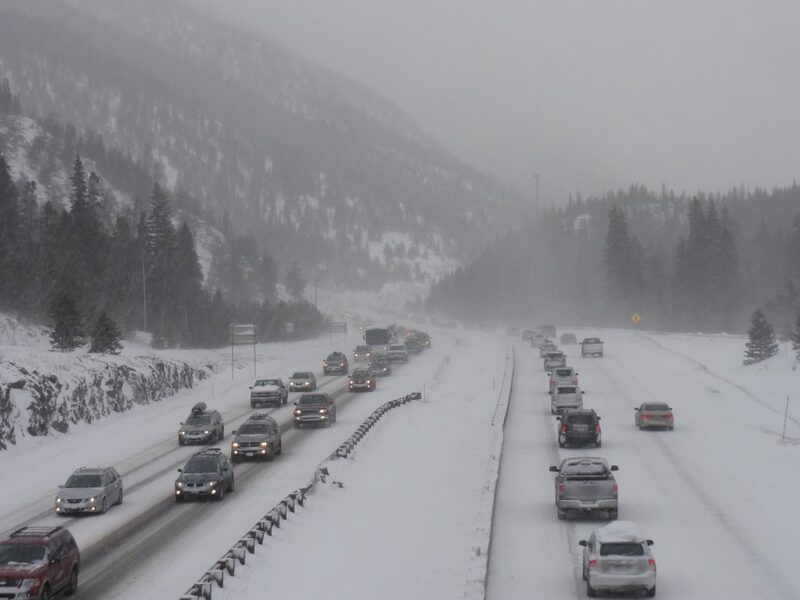 Every year, new record traffic counts are set at the Eisenhower Tunnel and it’s a rare day that you don’t find a slow-down or stoppage somewhere between Denver and Summit County. Colorado neglected road maintenance for decades because of tax cuts and it really caught up with us. Mass transit to the mountains?? What are you… some kinda Commie tree hugger??!! The Colorado Department of Transportation has found that it costs our mountain communities $800,000 PER HOUR when the road is closed. Yet years of studies by the State have only come up with one solution: more lanes. Support for a rail system has had its ups and downs, but pressure for one is building from local governments and citizens. Tax cutting naysayers are still standing in the doorway, however. Those European solutions don’t work for America, you know. Eventually, the cost of lost revenue will outweigh the cost of building a more efficient transportation system and perhaps then we’ll get some action. In the mean time, people are finding more immediate ways to cope with the traffic problem. An increasing number of Front Range residents are buying property in Summit County just for a place to stay on Friday and Sunday nights and so avoid the skier rush Saturday mornings and Sunday nights. Many of these buyers are younger folks looking for low cost properties just to crash in over night. They often move up to more expensive property after a few years and keep the first place as a rental. In the early days of our real estate market, weekenders were the market. Basic condominiums and homes with small kitchens and baths and often having no laundry facilities or garages were built to accommodate them. Over time, they were replaced by semi-permanent second home owners who wanted larger places where they could spend weeks or months. The older, smaller units fell out of favor for a while and became long-term rentals or affordable housing for local residents. But the Front Range market that low-end properties were originally built to serve is coming back again. And that demand is causing the “low end” to get really expensive. Who ever thought that a one bedroom Dillon Valley East would be worth $180,000? As long as people keep moving to Colorado at this rate, traffic will get worse and housing prices will increase. Even a fancy Swiss-style rail system won’t stop that. Lately in the real estate business customers are either extra mature and not real tech savvy or 20-somethings who can’t understand why you didn’t instantly respond to their tweet of 3 minutes ago. So match up a buyer who’s 20-something and a senior seller and it can be a challenge. Young Buyer: We haven’t heard back from the seller yet? We sent the offer over 10 minutes ago. Anything yet? Not yet! How about now? Nothing! Now? Anybody got anything? Senior Seller: What’s their rush? Can’t you just mail me the offer? My son/daughter/friend will come over and fix my e-mail on Thursday. And often that’s the match up. Sellers have often owned these second homes for decades and may even be original owners. Occasionally, it’s their kids who become the sellers after inheriting the property. Then the issue is not response time or tech ability. It’s the emotional issue of selling a place the family grew up with. The young buyer hits a big speed bump when he or she discovers you don’t just go online to get the loan for a condominium or property with an HOA. 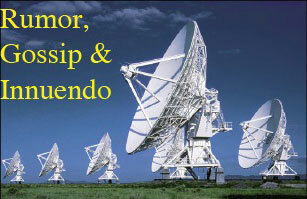 You need to actually talk on the telephone to a local lender who can actually do the loan. It’s not instant like in the Quicken Loan TV ads. Usually we can guide everyone to a successful conclusion. We get a relative to handle the time critical parts of the transaction for the senior seller and can usually calm the young buyer down enough to get through the “old school” loan process. It’s not just real estate, folks. My job is psychologist, family counselor, financial planner and dispute resolver. I’m not officially any of these, but I do play them all on TV. Silverthorne’s new performing arts center opened in June… no more squeezing into a small drafty historic building to see plays and concerts. This will be one of the better $9 million investments the Town ever makes. The agin’ers who are still mad about the Rec Center after 20 years will be apoplectic over this, I’m sure. Every road in Summit County… is coned off just in time for July 4th. Nothing happened for 40 years then in June every road project began at the same time. Don’t these guys talk to each other? Oh… maybe they do. There’s good news and there’s bad news… Summit County has the highest life expectancy in the USA at 86.3 years per a University of Washington study this year. However, another recent study finds Summit and Eagle counties have the highest health care costs in the country. So, to recap: In Summit County you’ll live forever but you’ll be eating cat food ‘cause it’s all you can afford. A new bike race will visit Breckenridge as a race venue this year… the Colorado Classic will be in town August 11. No long distance multiple pass routes this year, just local circuits. Lots of world class men and women racers will be here, however. We’ll see if shorter is better. Another in the continuing series Signs That The Apocalypse Is Imminent: New developments are beginning again in Winter Park. Each time in the past when large new construction projects have begun in our neighbor over Berthoud Pass, an immediate recession has killed the whole thing. Instead of new housing, those guys really need a tunnel under Berthoud Pass. Boats and paddlers on the lake and happy visitors flit from shop to shop. The number of outdoor cafes and bars has increased every year so now you can sit and watch the strollers as you have a glass of wine. Summer… again… my 45th in the mountains. Enjoy your stay!